Riding boot purchases can be a time consuming process. There’s no lack of product to choose from these days. At a minimum, selection decisions include type, style, protection, comfort and price though not necessarily in that order. Choices get easier though when the intended use is well defined. Top-flight boot makers like Alpinestars and others offer great selections for street, track and motocross. Something for everybody. Unfortunately, Adventure riders have typically had fewer choices but more factors to consider. If you’re a member of this expanding segment you probably already know. Full on MX boots offer great protection but if your rides don’t include three story Supercross jumps, the flexibility, weight, and walking comfort of those multi-buckle monsters are drawbacks. Traditional road boots are fine but if your trips are heavily skewed towards off-road, more aggressive soles and taller profiles are desirable. If your route sheets includes water crossings or a “rain or shine” itinerary then you have even more considerations. 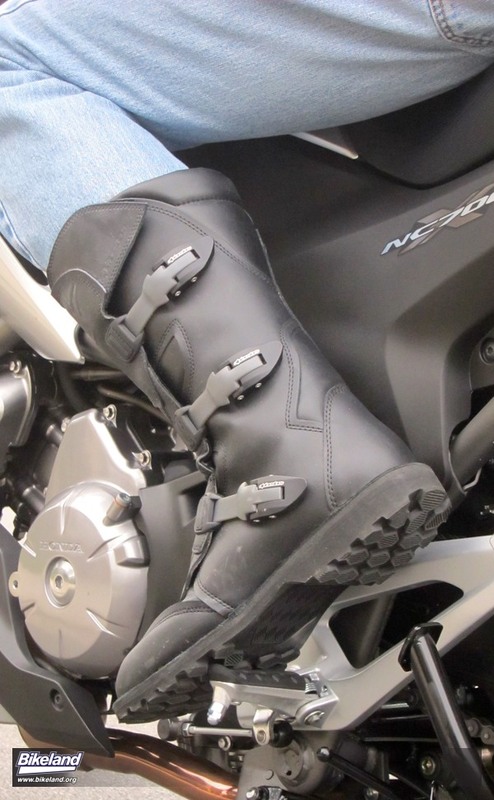 Hybrid off-road boots like Aerostich’s Combat Touring boots and these Alpinestars Scouts have emerged as good options for Adventure riders. Although they don’t offer the same total protection as higher end off-road only footgear their sturdy construction, all day comfort and lightweight make them contenders. For riders who minimize really extreme terrain exposure or just don’t want to carry additional shoes on short tours hybrids can be a great way to go. Bikeland spent several months with A-Star’s Scouts using them for every day street riding and some off-roading. We came away pleasantly surprised. The Scouts are very lightweight. Even compared to Alpinestar’s own Tech 8 Light MX boot, comparable sizes are about a pound and half less per foot. That difference really affects how tired you feel at the end of a long day. The Scout’s all leather construction makes break-in quick and the boots felt very comfortable right out of the box. The three-buckle design allows them to slip on and off easily and provides easy micro adjustments to customize fit. We found the fit runs pretty true to size trending just a smidge large on our size 10s. Externally the hook & loop flaps and buckles were slim enough to fit under Draggin jeans with no problem and we even managed to squeeze them over a pair of Levi 505’s. The inside of the boot is well finished. The mesh lining allows some breathability. One of our more sensitive testers found it desirable to wear tall socks. Normal height socks allowed a stitched seam at the top where Velcro meets leather to chaff his shin a bit. No big deal, but it is a reminder the Scouts are taller than typical road boots. The padded PE foot bed and insole provide good support for extended peg standing when necessary. Ankle padding is on the modest side but heel and toe construction is confidence inspiring. The reinforced toe overlap does not hinder shift lever feel like some boots do. The Scout’s flagship feature is its waterproof construction. Lacking a good full day rain opportunity, Bikeland’s intrepid tester resorted to full immersion bucket testing but was unable to induce any leaks. Even if you don’t live in Seattle, having a boot with this feature eliminates the need for wet proof treatment or carrying Totes for the times you get caught out. The Scouts were comfortable in typical Spring/Fall temperature ranges and we never experienced clamminess although our test window didn’t include peak summer sauna exposure. The Scout’s waffle-like tread pattern incorporates rows of hexagonal shaped lugs with randomly oriented sipes that make for secure footing. Pushing bikes around slippery gas pump pads, even on misty days, was easy. Alpinestars employs a proprietary sole composition to enhance grip. The Scout sole saved the day once when we encountered fresh cage fluids on an intersection paint stripe. The grippy soles do require a bit of caution though if you prefer the foot-down dirt track style of off road corner skimming. The choice of a “skidder” sole would be nice but it might complicate what’s now a refreshingly simple selection process. At a suggested retail price of $249.95 the Scouts are a good value. They’re comfortable for extended walking, light enough for everyday commuting, and can be your go-to boot for most off-road adventures. Dual Sport boot decisions are getting much easier. 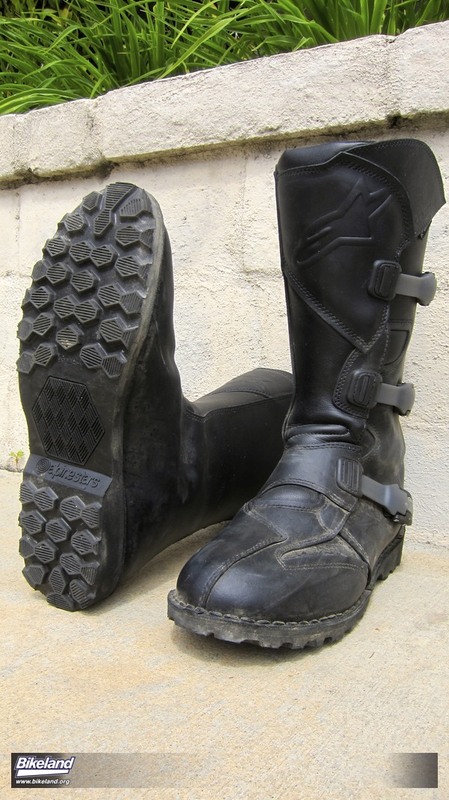 A tall multi use, all season riding boot suitable for dual sport touring bikes or sport bikes. Scout is a durable, waterproof leather boot with a stitched sole engineered for exceptional grip on slippery surfaces. -	Full-grain leather bonded with a waterproof membrane for a fully watertight boot. -	Internally molded shin, toe and heel counters for excellent impact resistance and abrasion. 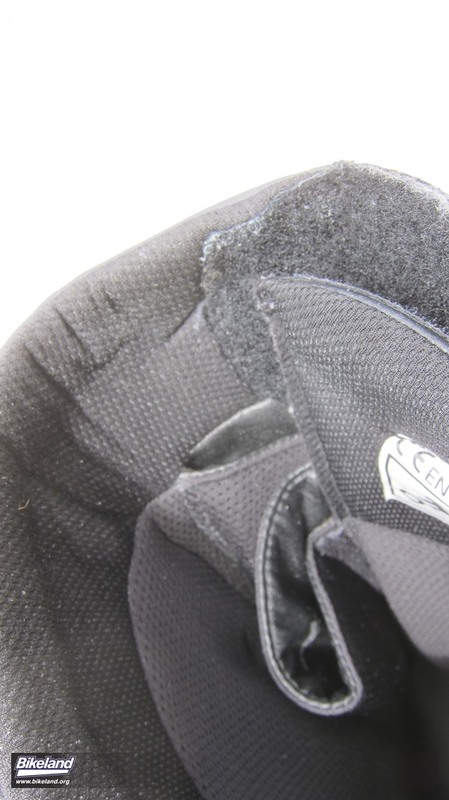 -	Removable PE padded foot bed provides shock absorption and impact protection. Breathable mesh foot bed liner is breathable and keeps foot dry. -	Stitched sole is unique rubber compound for exceptional grip. -	Outer calf and foot 3 buckle closure with micro-adjustable memory system. - Inner calf leather is S/Mooth for bike feel. -	3D micro injected Alpinestars logo on shin.